✅Detachable foam with magnetic property – 9 pairs of magnets allow the frame to be tightly linked with the foam. The detachable foam makes it easy for users to clean the frame and the foam connected with face. This new design will let your face be more comfortable. 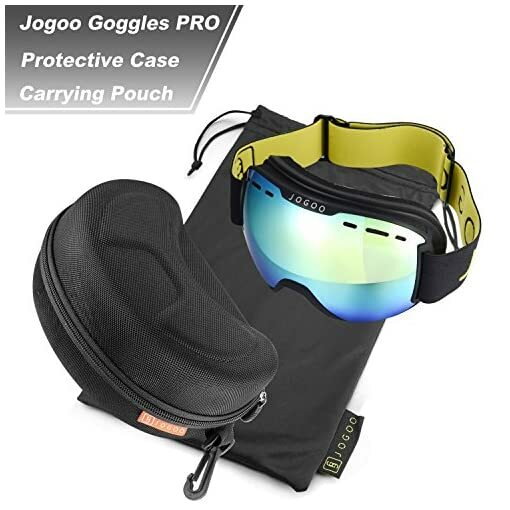 ✅Helmet Compatible – The length of the soft strap can be adjustable and the maximum length can be 1 foot. 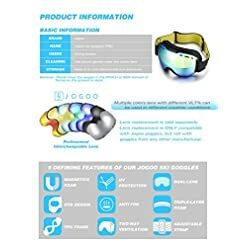 The elastic strap ensures the compatibility of all helmets and suitable for both adults and teens. 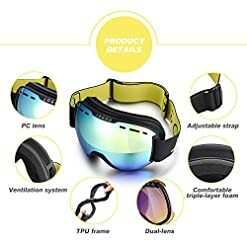 ✅OTG (OVER THE GLASSES) Design – OTG design allows various glasses to be easily installed on the goggles. 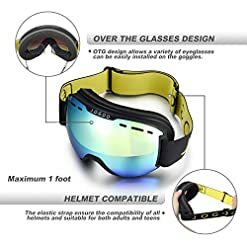 Users do not worry of wearing glasses while using the ski goggles. Polarized dual-lens insulation and anti-fog coating will give you a CLEAR VISION. Magnetics detachable foam makes it easy to assemble and disassemble, and clean the ski goggles. Comfortable triple-layer foam will make your face more confortable. PC lens and TPU frame allow the ski goggles to better prevent from the impact force. 1.Please do wipe the OUTER LENS with the pouch gently, if the outer lens get dirty. 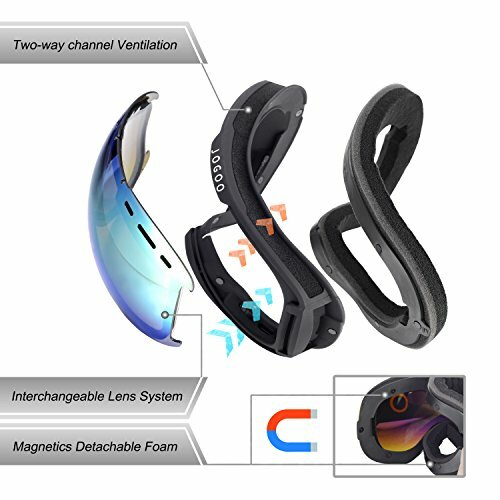 2.Please do not wipe the INNER LENS which will invalidate anti-fog function. 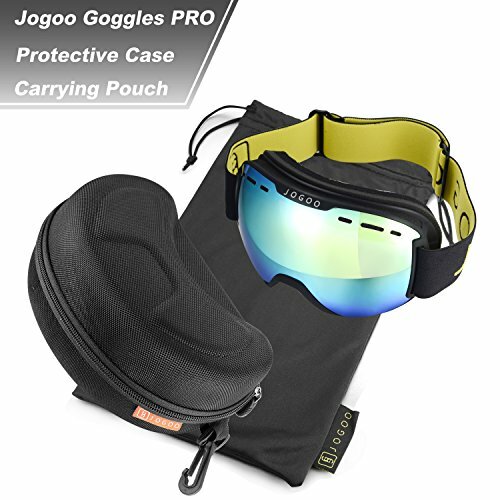 3.Please keep the goggle in the POUCH or BOX instead of facing on the ground or desk. 4.Please do not use mascara or other oily substance in case lens gets dirty. 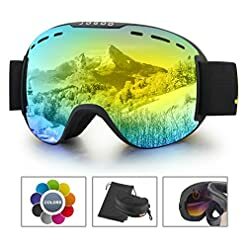 5.Please air-dry the goggles after every snow sport e.g. skiing, snowboarding and etc. 1. Lens replacement is sold separately. 2. 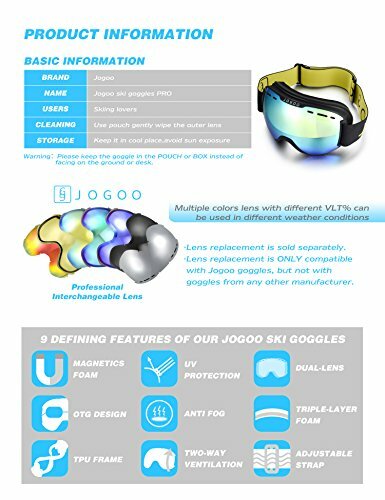 Lens replacement is ONLY compatible with Jogoo goggles, but not with goggles from any other manufacturer. 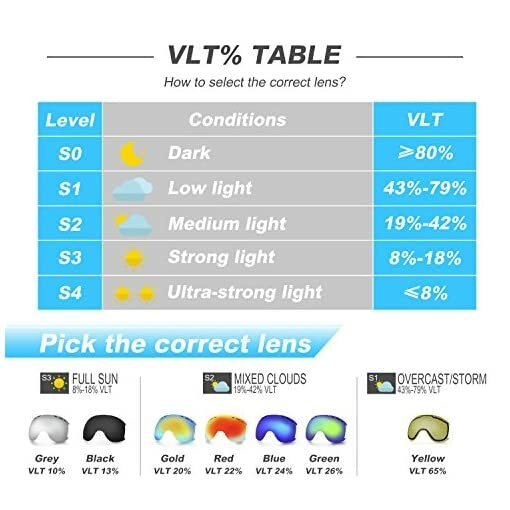 VLT 0-8% – Suitable for sunny day with bright light. 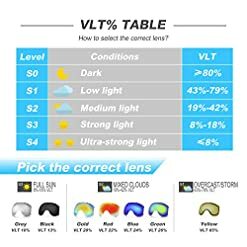 •VLT 9-18% – Suitable for sunny to partly cloudy day. VLT 19-42% – Suitable for overcast, cloudy,foggy day. 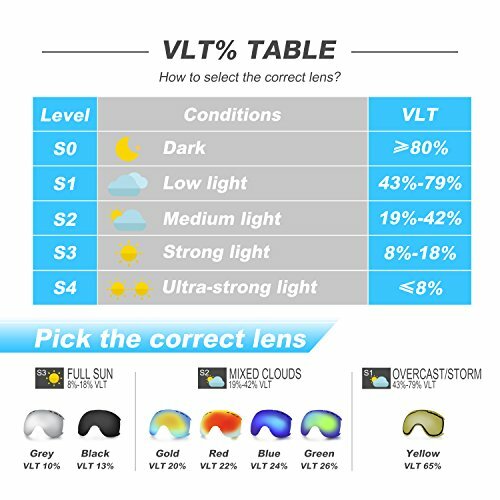 VLT 43-79% – Suitable for low light conditions. VLT 80-99% – Suitable for dark night. ✅Excellent Service – Jogoo offers a guarantee of 30-day full refund. Our customer service will respond to your questions within 24 hours to ensure a satisfying purchase experience. We guarantee that you will not waste money for buying our products. Do not hesitate and hurry up to add the ski goggles to your cart! ✅Professional Replaceable Lens – 1.Users can choose different lens according to various weather. Multiple colors with different VLT% allow users to wear the ski goggles in different conditions.2.The spherical lens made in Italy offer users broader view. 3.All the lens have the property of anti-fog and UV400 protection. 4.It prevents the lens from falling off. The lens slot is safer than that based on magnetics property, and the slot can prevent the glasses from falling off while you are skiing.